South Korea have banned Middlesbrough striker Lee Dong-Gook for 12 months over a late-night drinking spree during the Asian Cup. Lee Dong-Gook joined World Cup hero and 34-year-old keeper Lee Woon-Jae at an Indonesian karaoke bar. The keeper has been banned from internationals for three years and told to do 80 hours community service. Boro player Lee Dong-Gook is also banned for two years from events South Korea's Football Association runs. 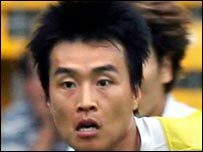 Kim Sang-sik and Woo Sung-yong also joined keeper Lee Woon-Jae at the bar and have been given the same punishment as Boro striker Lee Dong-Gook. Famous for his crucial penalty shoot-out save against Spain which led South Korea into the semi-finals of the 2002 World Cup, keeper Lee Woon-Jae offered an emotional plea for forgiveness before the hearing which decided his fate. "We made a grave mistake. There is no room for excuses," he said. "I was captain at the time and I will accept any punishment the association hands me." Give your reaction to Dong-Gook's drinking antics. Can he cut it for Boro? According to the KFA, Lee Woon-Jae - recently shortlisted for Asian Player of the Year - defied rules and left his team base to visit a local bar with friends in Indonesia two nights before the 2-1 group-stage loss to Bahrain on 15 July. The day after the match he took Lee Dong-Gook - along with Kim and Woo - to a karaoke bar in Jakarta, where they drank into the early hours with female bar employees. South Korea finished third in the tournament but scored just three goals in six matches. Coach Pim Verbeek later resigned. The impending national team ban comes at a bad time for Lee Dong-Gook, who is battling to prove his worth to Boro manager Gareth Southgate. The 28-year-old, regarded as one of the best players in Asia, has started only four Premier League matches and is yet to score a goal since joining the club after a successful trial in January. "I have not had the chances and I have had too much pressure on me," he said. "I will do my best to make sure the memory of me to Middlesbrough fans is one that I am a passionate player. "This league is very tough and fast, much more than Korea."